Tooth extraction may sound easy but in fact experiences as well as the proper teeth extraction techniques are required to ensure that the tooth is safely out of the mouth. 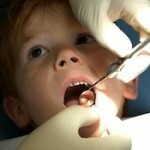 There are generally two methods of teeth extraction – simple or surgical extraction. Simple or intra-alveolar extraction – Simple tooth extractions are done on teeth that are easily seen in the mouth, usually under local anesthetic. They require only the use of dental instruments to elevate and/or grasp the visible portion of the tooth. The route of approach is solely from inside the tooth socket within the jaw bone. Surgical or trans-alveolar extraction – Surgical extractions involve the removal of teeth that cannot be easily accessed due to the tooth being not fully erupted or the tooth has broken under the gum line. In the surgical method, an incision is almost always required. Here bone is removed around the tooth by dissection though the jaw bone after the overlapping soft tissues are retracted as a gum flap. When is surgical extraction indicated? Central incisors have straight conical roots with a circular cross section that yields to primary rotation. Lateral incisors have straight slender roots flattened on the sides. The forceps is pushed towards the root and the tooth removed in the direction towards the cheek (buccal). Canines have a sturdy triangular cross section and longer root. Removal is through application of force in a buccal direction. Sometimes a surgical extraction might be needed. First premolars have two slender roots that can be easily fractured. Bucco-palatal (Cheek-palate) motion is applied whilst pulling. This is the only tooth in the mouth that is pulled out and not pushed. Second premolars have a stout single root and can be safely displaced in a buccal direction. 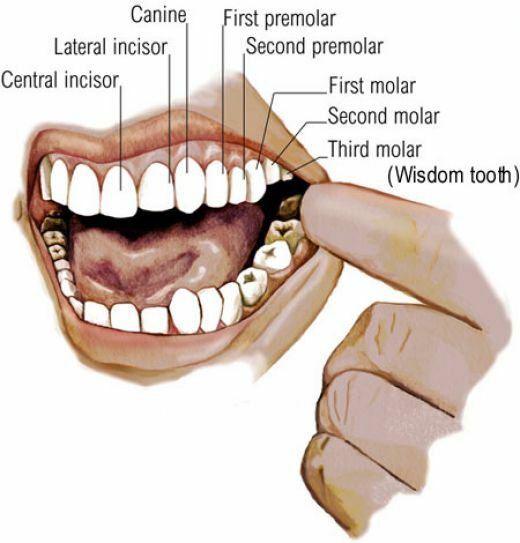 First molars usually have one palatal and 2 buccal roots. The molars should be pushed well up into the root mass before dislodging the tooth with buccal movements while maintaining upward pressure. Disto-buccal twist is used to deliver the tooth out. Second molars have variable root pattern. Disto-buccal twist is used to deliver the tooth out. Third molars have a single conical root but may also have variable root forms. Tooth is usually placed towards the back. Hence forceps placement is difficult which is furthermore hindered by the presence of the coronoid process. Therefore elevators help in this situation. Lower incisors roots are flattened on the sides, making their front profile very narrow. They yield to bucco-lingual (cheek-tongue) movement. Canine root is thicker and longer than central incisors. If buccal movement is resistant, secondary rotation can be applied. First and second premolars have a straight single root that is round in cross section therefore amenable to rotation. Lower first molars forceps are designed to grip in between the roots. Movement should be towards the buccal side with bucco-lingual oscillation and figure of 8 movements. Lower second molars root pattern is similar to that of first molar. The buccal plate of the jaw bone becomes thicker towards the back in this region. Cheek displacement may be difficult and primary movement is in the tongue direction. Lower third molars show extreme variation in shape and size. Often impacted needing surgical removal, they are encased in dense bone of oblique ridge and close proximity to the inferior alveolar nerve and lingual nerve which add to the hazard of removing these teeth. Teeth in primary dentition are easier to remove than permanent teeth. They have less substantial roots that are often resorbed or dissolved away than the permanent teeth. The underlying permanent tooth is closely related to roots of the primary tooth and can be damaged by placement of extraction forceps. This is particularly true in case of primary molars. The forceps blade must be placed on either the front or the back root and not in between them. It is usually advisable to leave the root fragments alone and allow natural resorption rather than risk damage to the permanent.